Having seen this film many years ago when it came out, a recent re-watching of the Blu-ray at home with my wife has cemented itself as a tight and well-done film. While most action films like to confuse the audience with shaky cameras and quick cuts, this one starts calm and builds to an exciting conclusion. Of course, it’s not just a steady and methodical thriller, it loops back on itself, tying up all loose ends and bookending the whole plot in a neat little package. Each of the segments where they drive to the next destination gives a chance for excellent character building as well as giving the audience a break from the brief moments of action (which steadily get longer and more intense as the film progresses). Along with the overhead tracking shots and expert use of depth of field, this film almost borders on art. These are what good action films should be. What’s also interesting, upon a second viewing almost 14 years later, is how many recognizable actors are in this film. Some of them are bit parts, and they don’t quite look like their more famous character portrayals, but inevitably you’ll go, “Isn’t that so-and-so?” From Jason Statham at the beginning, Jada Pinkett Smith on either end, Mark Ruffalo with some “ethnic-looking” facial hair, and Javier Bardem years before No Country for Old Men (2007). Most of these actors had not hit their stride quite yet, but Jamie Foxx definitely gave a great portrayal of a character who undergoes plenty of superb character development (which is partly why he was nominated for this film, along with Ray (2004) in the same year). Quite the suspenseful thriller, Tom Cruise pulls off his part eerily well and Jamie Foxx portrays a quiet hero excellently. 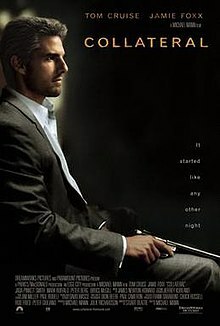 I give Collateral 4.5 stars out of 5.